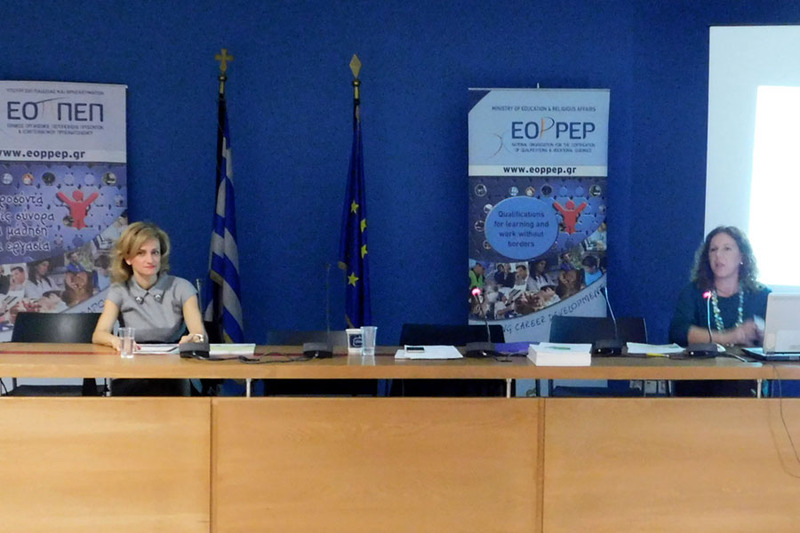 Cedefop expert Anastasia Pouliou presented and discussed the latest EU developments of national qualifications frameworks (NQFs) at a peer learning activity organised by the Greek National Organisation for the Certification of Qualifications & Vocational Guidance (EOPPEP) in Athens on 20 December. The main focus of the event was the contribution of the European qualifications framework (EQF) and NQFs to the recognition and equivalence of awarded qualifications. Participants included experts of the Greek Recognition and Equivalence Committees and competent authorities. Themes discussed included policy objectives, the use and feasibility of NQFs and the EQF, and the indication of the relevant QF level to qualification certificates or diplomas and other documents issued by the competent authorities. She also presented the new European handbook on learning outcomes and the 2017 update of the global inventory of regional and national qualifications frameworks, underlining that Cedefop will continue the smooth cooperation with the Greek authorities.